Provided that the notion of authority delegation is accepted, accept the notions of mutual authority delegation and one-sided authority delegation as subtypes of authority delegation. The modification was suggested to Scientonomy community by Nicholas Overgaard and Mirka Loiselle on 7 September 2016.1 This modification presupposes the acceptance of Sciento-2016-0003. The modification was accepted on 2 February 2018. The different kinds of relationships that can exist between any two scientific communities make it necessary to distinguish between two subtypes of authority delegation: mutual and one-sided. Some scientific communities, such as physicists and biologists, delegate authority to each other over different topics. In other instances, however, a community will accept theories of another community without the latter community accepting any of the theories of the former; such is the case with philosophers and physicists, for example. Accept the notions of mutual authority delegation and one-sided authority delegation as subtypes of authority delegation. 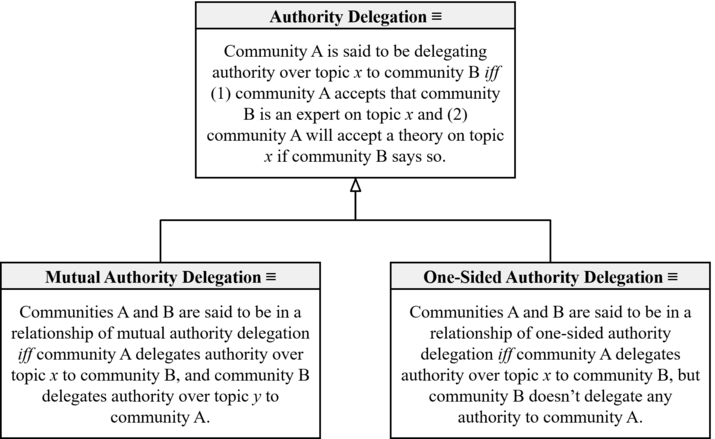 Mutual Authority Delegation (Overgaard-Loiselle-2016): Communities A and B are said to be in a relationship of mutual authority delegation iff community A delegates authority over topic x to community B, and community B delegates authority over topic y to community A.
One-sided Authority Delegation (Overgaard-Loiselle-2016): Communities A and B are said to be in a relationship of one-sided authority delegation iff community A delegates authority over topic x to community B, but community B doesn’t delegate any authority to community A. This page was last modified on 13 February 2018, at 23:24.